The stifle is one of the three main joints in the hindlimb and is located between the hock joint and the hip joint. Stifle orthoses are most commonly used to manage cranial cruciate ligament injuries, but can also be used to support against medial and lateral collateral ligament laxity. This type of orthotic device may be used in place of surgery, when surgical repair is not a possible or desired option, or it may be used at some distance after surgery if the procedure did not create the desired level of stability. It is important to note that while a stifle orthosis is not equivalent to surgery, a properly designed, well-made device can offer significant support to the joint. A stifle orthosis will cross the stifle joint and extend down to the hock and up to the top of the thigh. Having long levers of support on either side of the joint increases the effectiveness of the brace and also allows pressure to be spread out over a larger surface area. 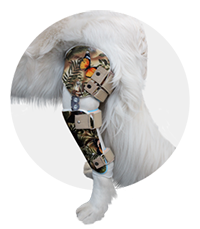 When deciding on the type of stifle orthosis to get for your dog it is important to consider the how the device is made, what it is made of, and how that relates to the support that it can provide. Since a brace is already working from outside of muscle and soft tissue, it is critical that it have significant structure and an intimate fit in order for it to provide any meaningful control for the joint. which moves freely with flexion and extension of the stifle. most stifle braces can be self-suspending. In some cases the structure of the dog will not support this design and the brace needs to be held up with an over-the-hip suspension system which is linked to a front end harness. A stifle orthosis can also be extended downwards to include a section that crosses the hock if this joint also requires support. This combined brace would be a stifle-hock orthosis.